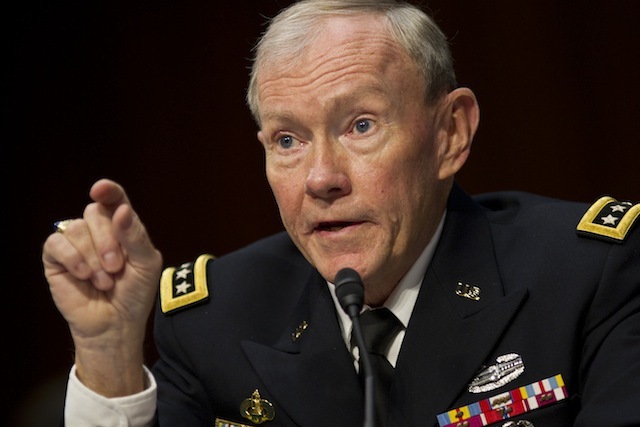 “It was totally objectionable, against our values and it wasn’t academically sound,” Army Gen. Martin Dempsey, the chairman of the Joint Chiefs of Staff, told reporters at a Pentagon press conference on Thursday. The instructor responsible for the course, Army Lt. Col. Matthew A. Dooley, is “no longer in a teaching status,” Dempsey added — but he is still employed at the Joint Forces Staff College in Norfolk, Va.
Dempsey’s comments were prompted by a Danger Room report on Thursday that described Dooley’s course in detail. For at least a year, Dooley taught an optional course at the college for lieutenant colonels, colonels, commanders and Navy captains that proposed taking a war on Islam “to the civilian population wherever necessary,” which he likened to the bombardment of Dresden and nuclear destruction of Hiroshima and Nagasaki. Guest lecturers in the course encouraged those senior officers to think of themselves as a “resistance movement” to Islam. Dempsey and his deputy for military education, Marine Lt. Gen. George Flynn, pulled the plug on the course last month. The general said he was “quite thankful” for an unnamed military officer who brought word of the anti-Islam material to his attention. Dempsey and his staff launched an investigation into “what motivated that elective to being part of the curriculum,” as he put it on Thursday, and the general also sent a letter to the heads of every military service and regional command instructing them to jettison any similar material, as per a White House directive issued last fall. The inquiry, conducted by Army Maj. Gen. Frederick Rudesheim, is scheduled to conclude on May 24. Any disciplinary action against Dooley; the college’s commandant, Maj. Gen. Joseph Ward; or any other officer is contingent on its findings.